This program has been discontinued. The ScummVM tools now come with their own GUI so use that instead. A program that adds a friendly, quick and easy frontend to the ScummVM command line tools (the additional tools that are included with the windows daily builds). 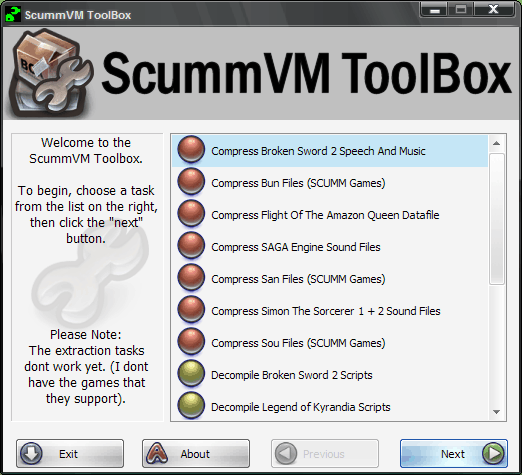 These tools let you compress the audio and video files in many games, extract the datafiles from certain games and decompile scripts from SCUMM games, the Legend of Kyrandia and Broken Sword 2. Uses a simple wizard interface that everyone should find easy to use. Automatically downloads and unpacks the ScummVM Tools; the user doesnt have to do anything but run the program. Manages temp files and cleanes them up automatically if a tool fails. Moves completed files to an area that you specify. Includes the necessary encoding tools such as lame and oggenc. Requires .NET framework 2.0 (you’ll probably have this by now, if not get it from windows update or here).